Art Gangster, “Paint Sprayed on Masterpiece,” 1974. 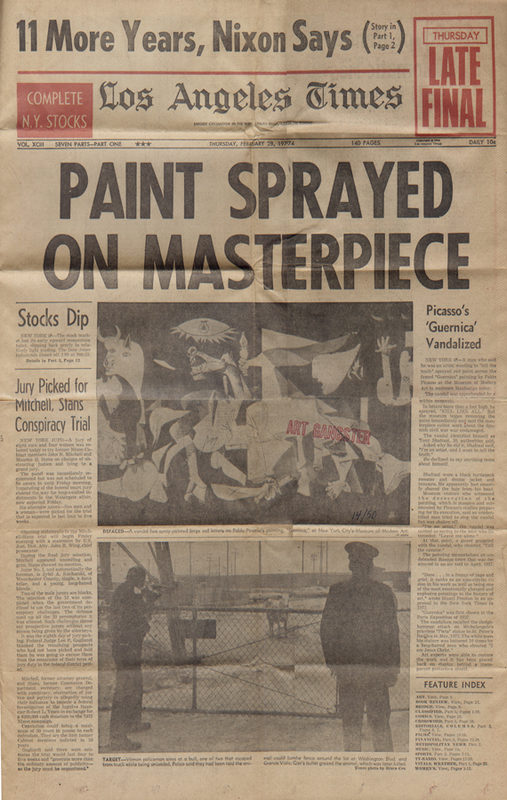 Front page of the Los Angeles Times with headline about the defacing of Picasso’s Guernica, February 28, 1974; signed “Art Gangster”with rubber stamp, and numbered with pen 14/50; ink on newsprint, 22 1/2 x 14 1/2 in. 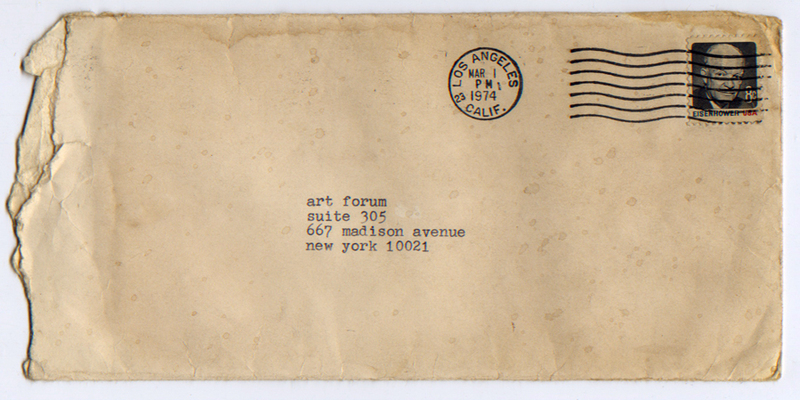 Mailed to Art Forum in an envelope postmarked, March 1, 1974. Does anyone know who the Art Gangster might be? It seems unlikely that it is Tony Shafrazzi (the actual “vandal”) since at this date he was immersed in legal troubles in New York following this act of defacement and the mail art piece clearly comes from Los Angeles. You can learn more about Tony Shafrazi (later a successful art dealer) and his decision to spray paint the Guernica in this East Village Eye article. Looking further, a Google search revealed a 1991 article that says artist David Hammons (who was living in Los Angeles in early 1974) sometimes referred to himself as an “art gangster” because he likes to take shots at the establishment.” Intriguing but far from definitive. 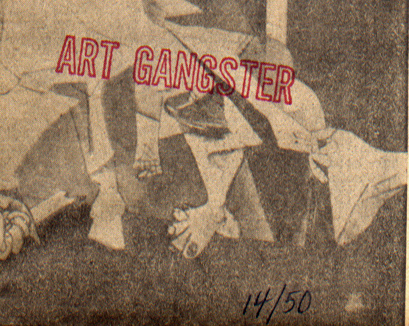 A second version of this mail art piece by Art Gangster can be found in the Museum of Modern Art’s library as part of the papers of artist Scott Burton. It was apparently given to Burton by the prominent art historian and critic Gregory Battcock. Update (August 22, 2017): Curator Gregory Ellis has helped identify the “Art Gangster” as mail artist Jerry Dreva. A 1980 High Performance feature includes images of Dreva’s other “Art Gangster” pieces, and of him holding a copy of the February 28, 1974 Los Angeles Times. Read more about this discovery here. 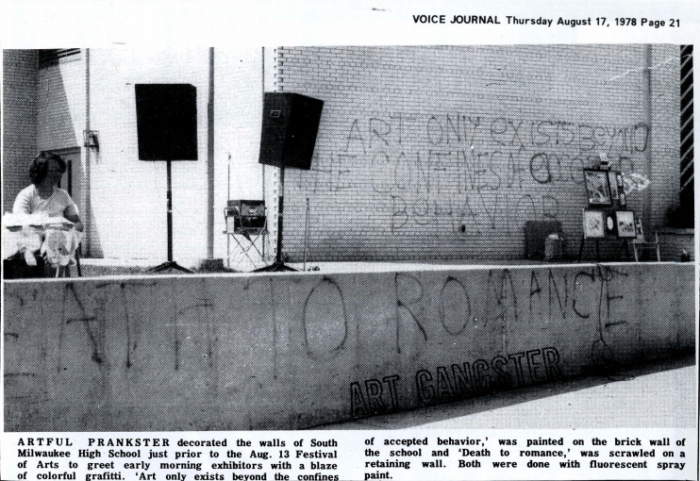 South Milwaukee Voice-Journal coverage of Jerry Dreva’s “Art Gangster” graffiti (reproduced in High Performance #9).